Television writer/producer; WGA member who most recently served as Supervising Producer for CBS’s Accidentally on Purpose. 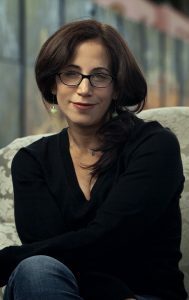 Ms. Greenburg was a Supervising Producer on ABC’s Less Than Perfect, and has written for Paramount (CBS), Sony Television (ABC), Touchstone Television (NBC) and Columbia/TriStar (UPN). She also produced and co-wrote the pilot Me and My Needs with comedy writer Judy Toll. As far as writing half-hour comedy is concerned, some people say a monkey can do it but we’re not monkeys, so we take a class. The whole point is to learn the basics so our ideas have somewhere to go, like onto the page and eventually into script form, and my class will teach you all the rules and tricks and methods that professional writers use but rarely discuss. The first trick is to learn how to write an outline, because it helps ensure the story makes sense, is solid, and once the script writing has begun, everyone knows where the story is going. It’s the ultimate blueprint from which most scripts grow. I’ve always compared it to figuring out the puzzle. How do I make this idea be told in this form? Where do all the pieces go? Getting this skill down is essential to the process of being able to go from concept to script with ease. I am more than happy to share this knowledge with you and guide you to writing a great sitcom outline — because monkeys while might be able to make people laugh, but they can’t write good outlines.